Holy smokes how could it be that I have been blogging for 8 years? Now my blog looks much different than it did when I first started as I was really blogging to keep family and friends updated on our new life in Australia but then I got the blog bug and decided to stick with it. Some of you have been with me from the beginning and to those of you I say a hearty THANK YOU and to those who have joined somewhere along the way THANK YOU as well! Adair Sanders reads a selection from one of her books. I recently discovered another author who lives here in Connestee Falls by the name of Adair Sanders. Adair is another amazing author and writes legal thrillers which to me are the almost perfect book. 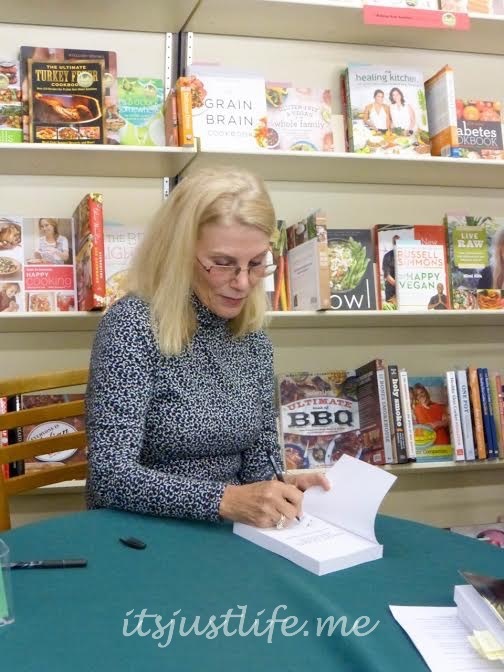 Adair, like Janis Allen whom I shared with you here, is another second career kind of writer and uses her expertise from 33 years as a trial attorney to use in her detailed legal thrillers. Her first book, Biologically Bankrupt, was the book she felt she had to write about her family and generational dysfunction. While this book is not for the faint of heart it is an insight into her life and what shaped her. I found it to be a fascinating read and can officially say I have read all 3 of her books now. Highland Books co-owner Amanda Mosser introduces Adair Sanders to the group. 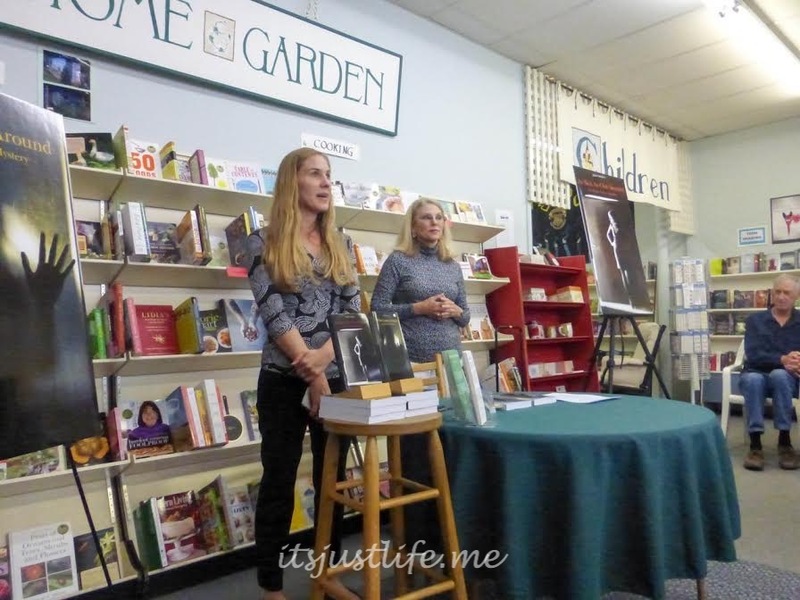 Adair graciously allowed me to give her some questions to answer before we met at a recent book signing at our local Highland Books. This bookstore has quickly become my favorite spot because not only do owners Chris and Amanda Mosser have a fabulous selection of books they also devote the front portion of their store to Ten Thousand Villages. If you know me you know I LOVE Ten Thousand Villages. I am definitely going to be supporting this bookstore for years to come. But now how about a little insight into Adair Sanders? 1. What made you decide to be an author? Was it always part of your dream or did it happen later in life? I never really thought about being an author. I did a lot of writing as an attorney, but legal writing is a totally different way of working with words, and generally does not translate well into an ability to write fiction (according to a writing teacher I know). My first published book, a memoir, tells the story of the effects of generational dysfunction in my family of origin. I was encouraged to write this story by a close friend, and I was also convinced this was a story I was supposed to write. After I published “Biologically Bankrupt” I was asked to turn that book into a screen play. Having zero idea of how to write a screen play, I enrolled in a dialogue writing class at The John C. Campbell Folkschool in Brasstown, NC. Low and behold, the second day of class, Allison Parker, trial lawyer extraordinaire and amateur detective made her presence known to me and the rest is history. I never did write a screen play for the non-fiction book. Instead, I’ve embarked on a career as a mystery writer in my 60’s! 2. If you could have dinner with any one author dead or alive who would it be and why? I can’t pick just one. Probably one of my favorite authors is Pat Conroy. His prose, his descriptions, his character development – reading his books was like living in them. The other author I would enjoy meeting is Lois McMaster Bujold. Bujold is a science fiction writer. While sci-fi is not really a genre I read much, I have loved her Vorkosigan series and would like to talk to her about how she came up with the story line and the characters. 3. What is your favorite spot to write? Are you a creature of habit and always write in the same spot or do you need variety? I write in the same place, and usually in the mornings. I have a small desk placed below a window which looks out to long range mountain views. I also use this spot for a daily meditation practice. I believe the combination of creating and meditating generates an energy field which is conducive both to writing and to my well being in general. 4.When you write do you have a particular process that you use or do you change it up? Do you do an outline and stick to that ? What is your writing process like? I find that writing in the same place somehow “opens” the creative process. At the beginning of each Allison Parker mystery I have had a general idea of how the story begins, but I have yet to know how the story will end until I am better than half way through the tale. Sometimes I will make a general outline of a story or plot line, but just as often I simply make notations on a legal pad about where I want a character to go, or what I want a character to say, and then as I write I see how that comes out on the page. Creatively, as I begin to write I start to “see” the story unfold in my mind’s eye – it becomes a movie of sorts that I record in black and white. In the current third book in the Allison Parker mystery series, which is intended for release at the end of this year, the firs sentence of the book just “appeared” in my mind about a month ago. It wasn’t until I spent several days playing with the opening scenes that I could see where the first part of that book is headed. All in all, I guess the writing process for me is an mysterious as the stories themselves. 5. Your two novels are legal thrillers and your background as a lawyer definitely came into play when you wrote them. Do you have to do a lot of research to flesh out the novels or does it just come naturally? I do some research on places that exist in reality – like the prison where one of my characters in the mystery series becomes incarcerated. Also, I lived in Mississippi for 20 years and am familiar with many of the places mentioned in the deep South. Also, I’ve relied on people I have known to flesh out some of my characters, but the mystery books are, in the end, complete fiction. 90% of what I write just comes to me during the creative process. 6. If you could give one piece of advice to the younger you —say maybe the teenage you—what would it be? Love and honor your True Self and don’t be afraid to take the road less traveled. Don’t you just love her? Meeting her in person was the highlight of my week and I am thrilled to know that she is working on her third book in the Allison Parker series. She revealed to us that the opening line of the third novel is “911 What’s your emergency?” I am hooked already. Adair signed a book just for one lucky reader of my blog. Don’t forget to sign up to win. 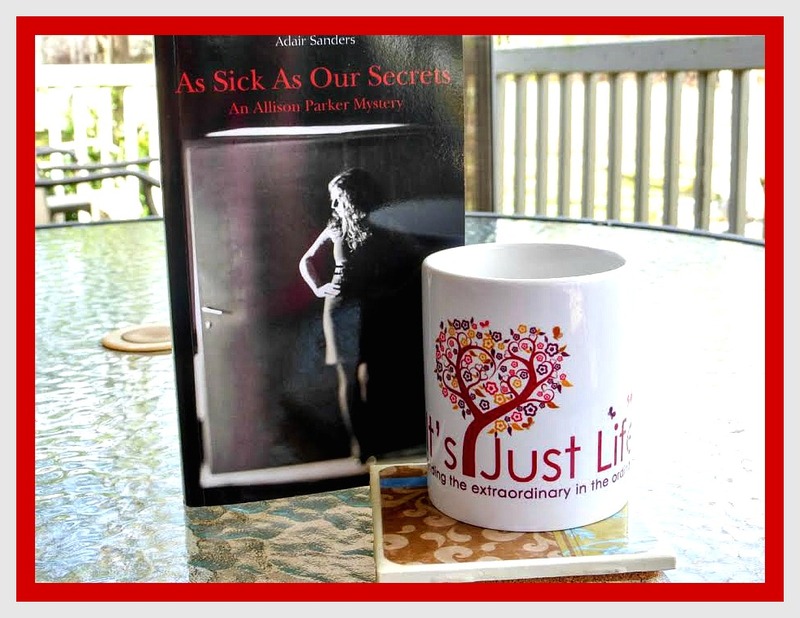 To celebrate my 8 years of blogging I would love to give one lucky winner a signed copy of the first book in Adair’s Allison Parker series along with an It’s Just Life mug and coaster. Use the Rafflecopter giveaway below to enter –there are several options and the winner will be announced after the giveaway is over on March 24, 2016. International entries are welcome as well. Special thanks to Adair for agreeing to be highlighted on the blog and for being part of my blogaversary. To connect with Adair Sanders please click on the following links. Don’t forget that every comment goes to support our Comments for a Cause this month -The Women’s Prison Book Project. Lucky you to meet an amazing author and in your new community. Adair´s books sound great! She really is an amazing woman in a lot of respects and her books are so good. Don’t forget to sign up for the Rafflecopter–you could win a copy! Happy Blogiversary! And I love how you are meeting local authors in your new home. 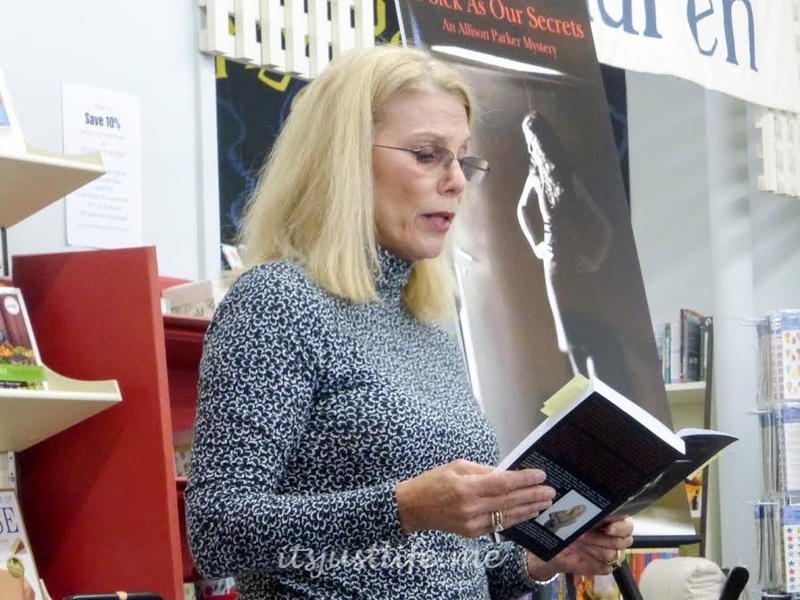 You have always been such a great advocate for local authors! Thanks! I do love to support local authors –there are so many talented people out there. Happy anniversary. You’ve been blogging even longer than me. Since I am a major fan of mystery books, I know I would love Adair’s books. You would love these. She is so talented and such an amazing woman. And thanks for the anniversary well wishes! Happy blogaversary! When you find yourself in the triangle, you should check out the lil’ bookstore in Fearington. I suspect you’ll like it! I suspect I would as well! I know the normal term is blogaversary but I think we should start saying Happy Blogabirthday instead. It seems to come with many more virtual balloons when I say it that way! So Happy Blogabirthday to you!!! Thanks so much! I love Blogabirthday! That is a perfect word! It was a fun morning! Thanks for inviting me! Thanks so much for going along! It was a great time ! I would love to donate it to our library!! You rock! I was thinking I need to get a copy of some of these to send to Val for her Little Free Library. I just love that you have a bookstore in your town! Happy Blogaversary! I love that you found a fun bookstore in your new town! Thanks, Sara. It is going to be my new hangout for sure. I love finding local authors to support and hearing inspiring stories of success taking on writing as a second career. It gives me hopen yet. Thanks for introducing me to Adair, she’s a new to me author. Tanya, Thanks so much for stopping by! I do love to meet new authors and Adair is really very talented. I am thrilled to offer a chance to win one of her novels on It’s Just Life.